People buy things on credit all the time. Credit cards are the natural way of buying now and paying later. This plastic money is actually a less-formal version of a loan. Then again, instant plastic money can also lead to an inability to pay the bill – especially with mounting interest – and then the credit card becomes what it always has been – a formal loan. People also make big purchases with bank loans. Cars and houses are the biggest purchases, but not the only. An unfortunate aspect of most new motor vehicles is that they automatically decrease in value over time. That brand new car is worth less as soon as one drives off the dealer lot for the first time soon after signing the papers. Many banks and credit cards departments of companies have their own collections department dedicated to getting the money owed to them. Other companies hire a collection services company to do the same. I can’t imagine the difficulty of having a job like that – but people do – and like all work positions, some people are very good at it. This story is about a forced possession – a repossession. Seemingly a sad tale, but not this one because this story is about goodness – about kindness … a story worth the 2+ minutes to watch. Although kindness comes in many forms, I wonder about human beings. Are we naturally selfish? Are we naturally positive or negative? How much of our behavior is innate as opposed to learned? As a person who enjoys staying informed by watching the news, I realize most news stories typically focus on something negative. After all, when the station does a short positive story near the end of the telecast, it seems out-of-place. On the other hand, I’m a firm believer that the majority of the world is good – which means I’m confident that the majority of people in people in international hotbeds are good. Yes, I believe the majority of people in Iran, China, Venezuela, Syria, Afghanistan, Russia, and all countries are good. After all, smiles and kindness are accepted with gratitude even with barriers in place as language, culture, and government.. I saw this not long ago on the Today show, so I’m glad the story is still available. NBC’s Hoda Kotb dressed up as a metermaid – an officer with a duty of issuing parking violations. Click here to watch the video, and enjoy! I’ve mention the Lauren Hill story here before, but it’s also became a national story than can touch the heart of anyone across the world. In short, Lauren is a college freshman on her college basketball team at Mt. St. Joseph University a small college on Cincinnati’s west side. During her senior year in high school, doctors diagnosed her with diffuse intrinsic pontine glioma (DIPG), a rare inoperable brain cancer. Initially given up to two years to live, her prognosis change to only a few months to live, yet she wanted to achieve her goal to play in a college basketball game … and she did … and my eyes shed tears every time I see this. Although DIPG attacked her brain, it aroused her heart and spirit, so she took it to our hearts. Through her battle and in spite of her weakness, she continues to hold her head high and focusing on others. She is truly an example for everyone in life, let alone someone who taken on the role of living, playing, and speaking for all those with pediatric brain cancer. Lauren Hill is someone for whom we are thankful. In the spirit of Thanksgiving (this Thursday in the US) and in the spirit of Lauren, I want to extend other thanks around this situation that haven’t received as much publicity … after all, honoring others is in her spirit. Cheers to the Hiram College Athletic Department (the opponents) for agreeing to and supporting a petition to the NCAA for changing the date, giving up a home game,and being willing to travel across the state. Cheers to the NCAA for allowing the game to take place approximately two weeks before the official start of the season. Cheers to Mr. Joseph University for honoring their commitment to Lauren. Cheers to Xavier University for donating the use of their arena for the game. Cheers to the Hiram players for doing the right thing during the game. Something that the videos here don’t show is how much of they reacted. Cheers to the citizens of Cincinnati who purchased over 10,000 tickets, thus sold out the arena in 30-40 minutes. Cheers to Mt. Joseph University for donating the proceeds from the game and merchandise sales to Lauren’s fund-raising efforts against DIPG. Cheers to the people who lined the streets as the team bus travelled from Mt. St. Joseph’s campus to Xavier’s. Cheers to Pat Summitt, the legendary women’s basketball coach at the University of Tennessee. Although fighting her own health battle (diagnosed in early 2011 with early-onset Alzheimer’s Disease), she attended the game to award Lauren the Pat Summitt Most Courageous Award from the United States Basketball Writers Association. Cheers to Lauren’s teammates because Lauren impact on them will be forever. Cheers to the national media for promoting this story. Cheers to the Hiram players and coaching staff who embraced the moment with class and dignity … and I’m sure they will remember the day more than the game’s final result. Cheers to Fox Sports Ohio for televising a game of a team that normally played before 100-200 people … and additional cheers to the broadcast affiliates from across the country who decided to broadcast the game. Cheers to Devon Still, the Cincinnati Bengal who reached out to Lauren amidst his own strife … a 4-year-old daughter with pediatric cancer …. and for that special bond, Lauren signed her game-day jersey for presentation to young Leah Still. Cheers to this touching segment by Tom Rinaldi on ESPN. See, there are many shining lights in the world for which to be thankful. Happy Thanksgiving to all. 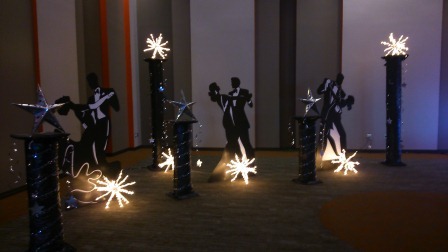 We arrived at the suburban convention center, then followed the red carpet to the upstairs ballroom where we found soft lighting, decorations, and plenty of tables surrounding a large temporary dance floor. At one end and above the floor, on the platform the DJ was checking his equipment from his seat beside the emcee’s podium. The judges’ area was to the left of the platform with forms ready for their completion. The people arriving were nicely dressed … some to compete and others as members of the audience. The event was a very special sanctioned dance competition with over 30 dancers competing in foxtrot, waltz, rumba, cha cha, salsa, tango, and swing. On this day, the competitors were adults with disabilities – primarily Down Syndrome. Several weeks ago my wife and I asked the organizer if she needed more volunteers – and she quickly said, “two males to compete” because two contestants needed partners for several dances. I checked our schedule and then accepted … plus my wife volunteered to be on the makeup and hair-styling team …. and the next day I secured a second male. I only had two short sessions to practice with my partners, but that was enough because the steps were simple and we were not to exceed outside the listed steps. At the competition, organizers placed in heats of 6-7 dancers that allowed plenty of room for both the dancers and the judges on the floor … just like in typical dance competition. My partners and I competed in four of the seven dances, making the semifinals and finals on three … and even winning third place in one .. but this day was more than that. Yes, it was a competition … yes, there were medals … but everyone one of the dancers were big winners. They loved dressing up, they loved dancing, they encouraged each other, and they appreciated others who smiled, said hello, or shook their hand with a smile … and we support dancers made sure the day was about our partners. The day was about the contestants, not the dancing pair. The emcee announced each contestant for every dance, but he never mentioned their partner. We were in the program, but after the contestants name. During the awards, contestants received the medals with great joy as the never-mentioned support partner proudly stood by them … and every support partner loved playing second fiddle on a day meant for others. The story about the organizer and how this group of people came to be is a post in itself, but on this day, my wife and I were very happy that we asked that question several weeks ago about the need for extra help. We smiled a lot on this day and left with a warmer heart, plus I know some tears leaked out of my eyes when the organizer took the time to dance with each contestant. All of us place friends in groups as high school friends, college friends, work friends, neighborhood friends, church friends, and other … well, and not surprisingly, we have dance friends. Ballroom dance has introduced us to many good people, but Teddy is the one who stands out the most for me. The first time one sees him doing something – you laugh, but with a smile. The more times I see him – I still laugh and smile – but the heart also glows. The more I watch him and now interact with him and learn more about him, I believe he is a special gift for all. Teddy is a native Cincinnatian who has become a local celebrity, and has even received national exposure. However, through it all, he’s absolutely the same person that he was before the madness started. From local articles, local television stories, and time with his (and my) favorite baseball team to attending the State of the Union as Speaker Boehner’s guest. From escorting two beauty queens (one on each arm) to speaking engagements and dance exhibitions. From a recent ESPN special segment to a shorter version ABC World News with Diane Sawyer (an America Strong segment), and to the latest as he’s now part of a Topps baseball card collection … and through it all, Teddy remains who he is … an example for everyone. Teddy Kremer is not a kid, but a 30-year-old man. As a swimmer, ballroom dancer, and equestrian, he’s an athlete. Regardless how one knows him, all who he has touched agree that he is special because he demonstrates what we should be – kind, positive, appreciative, personable, loyal, joyful for life, and other characteristics. I hope you take the time to watch this 12-minute story created by ESPN, and I have no doubt that Teddy will make you laugh and smile. After all, this video (just like Teddy) makes me laugh and smile, but in the end, I always shed a prideful tear … thus, I look forward to seeing him again on many Thursdays at the dance studio. As the holiday season has many running around in a state of crazed madness, it is also a time to find good news – especially in light of the horrific, devastating news about the Connecticut school shooting. As news organizations deliver us information about global conflicts, U.S. politics, Wall Street, violence, and more, this time of the year also allows these same newsrooms to give us positive stories – stories about the human spirit – stories of sharing and goodness. I’ve never heard of Possum Trot, Texas – a small, incorporated town near the Louisiana border that is financially poor – but through love, sacrifice, patience, commitment, and genuineness, the members of this community demonstrate their huge heart of gold that serves a role model for humanity. Follow the link to watch and see a proud side of humanity.